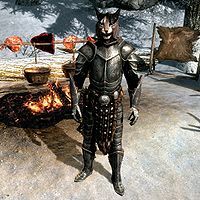 Kharjo is a Khajiit warrior who guards and travels with the rest of the trade caravan led by Ahkari. He can be found outside either Dawnstar or Riften, and walks the route in between. Upon meeting him, he will say, "Bandits harass the caravans at every step, but Khajiit usually scare them off." If you ask about the bandits, he explains that "A few days ago, we were ambushed. A nuisance, really, but many of the marauders had quick fingers. One of them stole my Moon Amulet, given to me by my mother when I was just a cub. It is my only memory of home in this cold land." If you offer to get it for him, he will say, "You are kind to offer. We believe the bandits are a part of a group headquartered here." along with a warning: "Be careful. I miss my amulet, but a life cannot be replaced as easily." Upon returning the amulet to him, he will express his thanks: "There it is. Ah.... Home.... If you ever need the skills of a Khajiit warrior by your side, I would be honored to travel with you. Until then, here. This is for you, in thanks." He can now be recruited as a follower. Kharjo can also be recruited into the Blades. When told to depart, or after waiting for too long, he will return to his original caravan. You can also ask if he guards the caravan, to which he will reply with, "Yes, I was hired to protect the others as we walk the roads of Skyrim. It is a thankless task and I would rather be back home in Elsweyr, but I have little choice. Ahkari freed me from a prison in Cyrodiil, and now I must repay my debt to him [sic]. A word of advice, my friend -- do not mix gambling and drink. Taken together, they will empty your pockets of every septim." You can also inquire about the dangers the caravan faces: "Skyrim is filled with all manner of dangerous beasts. Wolves, trolls, mammoths and giants would all like to make a meal of us. But the dragons are the most fearsome. Lucky for us, they don't seem to hunt along the roads." Kharjo wears a set of steel plate armor, including matching gauntlets and boots. He is equipped with a steel mace and a steel shield, and carries a selection of common loot and gold. After you return his amulet, Kharjo will wear it as well. You can take it back from his inventory when he is an active follower. When spoken to "If anyone sneaks up on us, I'll smell them coming. Or I might not. We'll see." "You're taking us somewhere warm, I trust?" Enemies are nearby "Something smells foul." When nearing an object/room of significance "By the Twin Moons..."
When approaching a cave "We've found a cave. I don't think there are warm fires and friendly faces inside." When approaching a Nordic ruin "The old Nords sure did love their stonework." When approaching a Dwarven ruin "By the Mane, look! A Dwarven city. Still sitting here after thousands of years." When healed "Ah! I feel like I just woke from a nap." A Courage spell has been cast on him "Even my claws feel sharper." When asked to trade items "I will shoulder some of your burden." When told to wait "Head on, then. I will keep an eye out." When talked to while he is waiting "You ready to get going?" When told to follow "Khajiit walks in your footsteps." When told what to do "It will be done." If told to do an impossible command "Not possible." If told to commit a crime "Even Khajiit have their limits. No." During battle "I'm going to... Put you down!" "Ha! Is that all you've got?" "Is that your best? Huh?" During battle with a dragon "Die, dragon!" Kharjo is one of only two Khajiit followers available in the game, the other being J'zargo. Kharjo also appears in the Heroes of Skyrim card expansion for Legends, as the card Caravan Enforcer. This page was last modified on 11 March 2019, at 21:26.